The make wonderful easy care indoor plants, have attractive flowers and foliage and they are the Peace Lily. Widely sold houseplants plants in Australia is the Peace Lily, or Spathiphyllum,(see picture right) also widely used in commercial indoor planting. And yes they are available for sale online. And Peace Lilies are actually fairly easy care, so we can see why its so popular. Easy to grow, hardy, grows well in low light and it flowers with a really nice flower, and all of that, sounds like a winner. Although the white flower really is really a real stunner, standing out strongly against the green foliage, the foliage in itself is also attractive, green, glossy, lightly ribbed and large enough to make a statement in itself. What makes these a great indoor plant is that the lighting conditions that they would naturally receive, filtered light in a rainforest are replicated in indoor situations. Consider the lighting created beneath a shady tree, it is not really dark, but little direct sunlight. Direct sun will burn the foliage. These plants prefer a little humidity and they do not like the cold. Humidity can be added by placing a saucer of water beneath the plant, sit some small pebbles in the the saucer to lift the pot out of the water (otherwise it gets too wet). As for temperature, ideally around 21C (70F) to 26C (80F) with a drop overnight to 12C (55F). Low temperatures over extended periods will kill these plants. Give the leaves a clean with a damp, chemical free cloth if they get dusty, watch out for any insects at the same time. Use a general purpose slow release fertiliser at 1/3 recommended rate. Too much sun will cause the foliage to burn and turns brown. Aphids and other leaf eating bugs can be a problem, but not often. Over watering will cause the soil to become anaerobic and the roots to rot. Over potting, like most plants Peace Lilies do not like to be a pot that is too big for them. One other problem with Peace Lilies is lack of flowers. This can be for a number of reasons, one is that the old spent flower heads are not removed. If these are left on the plant, the plant will put energy into setting seed, rather than producing more flowers. So deadhead your Peace Lily for more flowers. Can you grow them outside ? Yes, in a shaded position, in moist soil in a warm climate. We use a liquid fertiliser every 2 weeks during spring through summer, with a general purpose slow release fertiliser at the beginning of spring, this is also a good time to divide larger clumps and repot. And remember that most indoor plants need to be repotted every 2 – 3 years the Peace Lily is no exception. 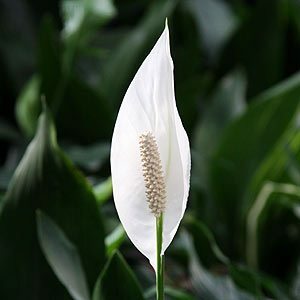 There are few varieties or ‘cultivars’ available for sale, they are all very similar, some are bigger growing such as Spathiphyllum floribundum or Giant Peace Lily than others, some have taller flower spikes, some darker or lighter foliage.